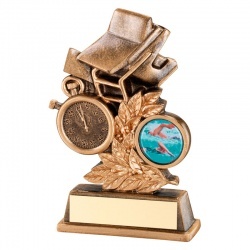 A choice selection of swimming trophies, plaques and awards all offered with low, fixed-cost text engraving and free logo engraving. Browse and buy online from this collection of glass swimming plaques and a range of low-cost resin awards that are suitable for both male and female swimming trophies and as prizes for a wide range of events and competitions. 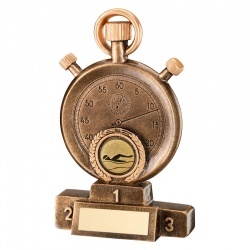 Resin bronze stopwatch award with swimming insert. 7in tall. Detailed resin award trophy with stars, stopwatch, googles and lanes. 7.25in tall. Resin Swimming Award in Bronze and Gold Finish. 6in tall. Resin bronze stopwatch award with swimming insert. 6.25in tall. Detailed resin award trophy with stars, stopwatch, googles and lanes. 6.5in tall. Resin Swimming Award in Bronze and Gold Finish. 5in tall. Resin bronze stopwatch award with swimming insert. 5.25in tall. Resin Swimming Award in Bronze and Gold Finish. 4.5in tall. 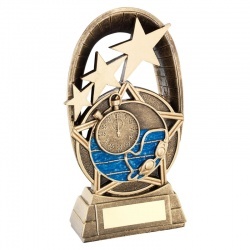 Detailed resin award trophy with stars, stopwatch, googles and lanes. 5.5in tall.